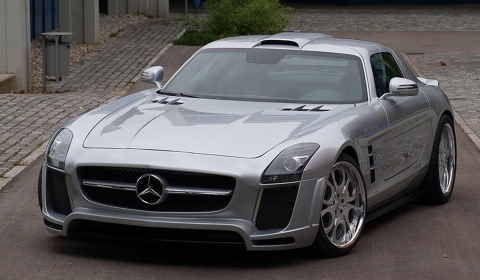 FAB Design has finally released some shots of their take on the Mercedes-Benz SLS AMG. The latest sports car from the German manufacturer has reached a ‘proper’ upgrade. The tuner changed the front bumper, side skirts, rear bumper and diffuser. They have added a hood scoop, rear spoiler, 20 inch rims, lower suspension using special springs and 40hp of additional performance. The total horsepower is now 611hp. The sprint from 0-100km/h has increased with only 0.1 second to 3.7 seconds. Any thoughts on the new design of this German sports car?